This week, we were proud to fly Humphrey the cat from Melbourne to Brisbane where he was reunited with his owners after he went missing over 6 months ago! Susan and her family were in the process of moving the whole family from Bendigo in Country Victoria to Brisbane in January this year, including their two dogs and cat that were booked in to travel with Jetpets. Unfortunately the day before they were due to travel Humphrey went missing. The family was extremely surprised that Humphrey went missing, describing him as a lazy fat cat. And despite desperate measures to try and find him, they had to make the heart breaking decision to move to Brisbane without him. They have missed him immensely, and have wondered often what happened to him. 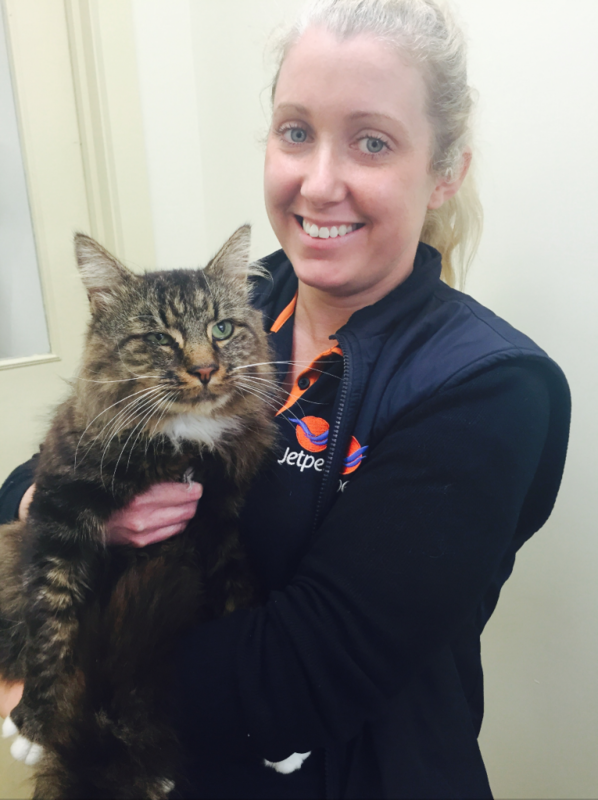 Last week Susan received a call from a vet in Bendigo with the fantastic news that Humphrey had been found! ‘I was overwhelmed when I spoke to the vet, who said that Humphrey had most likely been on his own for the past 6 months,’ said Susan. Yesterday was the exciting day that the whole family was reunited! Humphrey travelled with us from Melbourne to Brisbane where his family was waiting for him.